With the growing industry of Solar Thermal Products, a lot of products are hitting the market that are not built correctly, efficient, tested, or certified by the SRCC. As much as 60% Federal and State Tax Credits are given in some areas for qualified Solar Thermal Systems. That along would save you several thousand dollars in costs. But the panels must be SRCC rated for the any tax credits. In your shopping, you will find simple Flat Plat Solar Collectors, or Evacuated Tube Solar Collectors for sale within your local area. Some Evac Tube panels are sold as Evacuated Tube Collectors but are actually the less efficient Evacuated U-Tube collectors and not Evacuated “Heat-Pipe” Solar Collectors. When comparing Flat Panels to Evacuated Tube “heat pipe” panels, your earthly solar location is important. Flat panels are less efficient in cold weather in areas with temps near and below freezing. Be aware of your needs. It is important that you ask for SRCC certification. Some lower quality Solar Thermal Panels are out there. Look at the specific panel SRCC heat rating on their certificate and compare heat output. Our 30 tube panel is rated for over 46,000 Btu on a sunny day, for only 30 Sq Ft of Solar Aperture. Your Federal and State Tax Credits credits to you depend on the certification. Our Evacuated Tube Solar Thermal Panels and Flat Plate Panels have met all the SRCC requirements and rated to be installed as a quality product able to produce extreme amounts of Solar Energy for our customers, reduce their carbon footprints, and reduce their fossil fuel expenses. 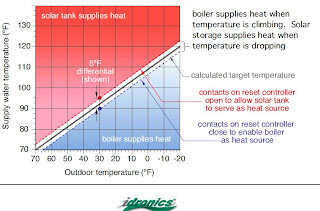 Back to the basics… compare apples to oranges when picking solar thermal panels. Get expert advice and design. 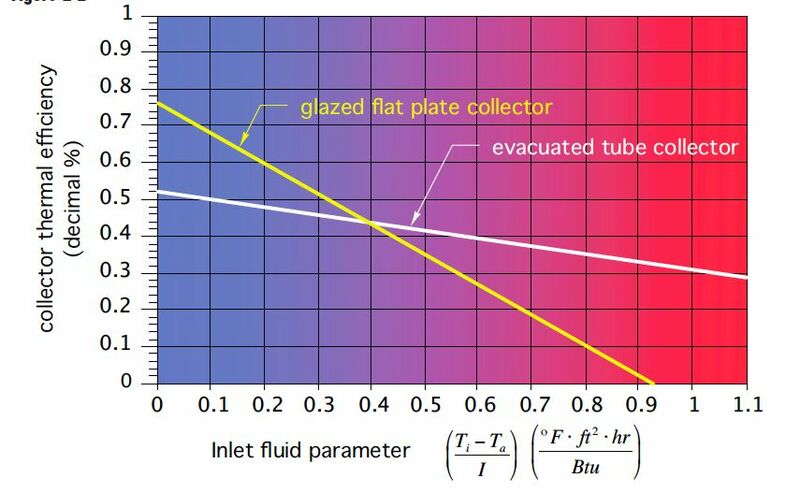 What about Evacuated Tubes vs. Flat Panels vs. Thermosyphon Panels vs. U-Pipes? Evac Tubes are great for hot summer days to sub zero temperatures, and can go on the ground, slanted against a house wall, or on the roof. They are not affected by wind or outside air temp and produce heat with all sun angles 360 degrees. Flat Panels are great for very hot to nearnfreezing temperatures, and can be placed anywhere also. But, they are limited to southern exposure and their efficiency is reduced in freezing areas or cold windy areas. In the sunny middle of the country, one of our Solar Evacuated Tube Panels will produce an average of 9,000,000 Btus per year, or 290,000 Btu's per year per sq ft at an initial panel cost of $38 per Sq Ft. On a bright winter day they will produce an average of 1,400 Btu's per Sq Ft per day. In the sunny middle of the country, one Sq Ft of our Solar Flat Panels will produce an average of 294,000 Btu's per year at an initial panel cost of $32 per Sq Ft. On a bright Fall or Spring day they will produce 1,418 Btu's per Sq Ft per day. 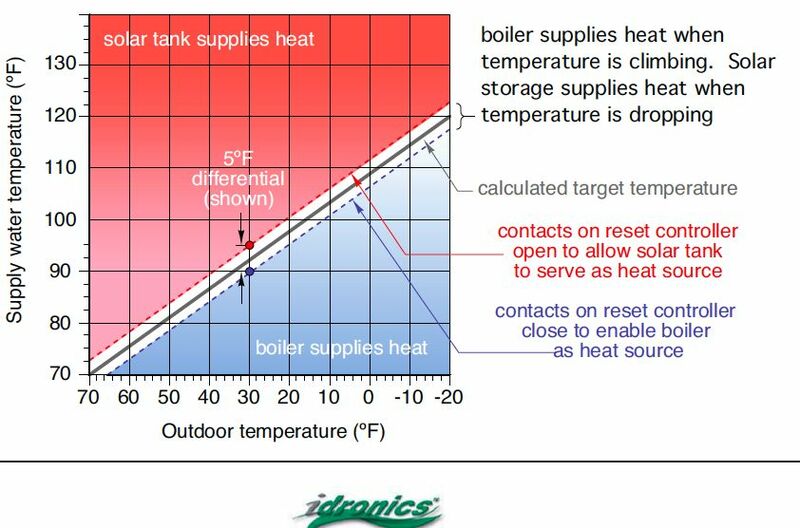 If you are in an area where near or below freezing temps are normal for the heating months, then Solar Flat Panels will not produce enough energy to match the Evacuated tubes. Solar Evacuated Tubes would be the proper and efficient Solar Panels for that climate. Flat Panels are more efficient in warmer climates than Evacuated Tube Panels, as Flat Panels are affected by outside air temp and cold wind. Evacuated Tube Panels are more efficient in warm to sub-freezing climates, as they are not affected by outside air temperature or cold wind, and absorb available sunlight from 360 degrees. Thermosyphon Panels are very simple and should be placed on the ground near the house. They are great for areas with freezing to hot temperatures and used with an open loop, i.e. city, cistern or well water is heated directly in the panels and goes right into your Domestic Hot Water Tank for house use. U-Pipes use evacuated tube technology but can be placed flat, sideways or vertical... as against a balcony railing or on a south house wall. Is solar water heating a viable alternative to gas or electric heating? Solar should not be seen as an alternative to heat sources, but rather a supplement. Solar cannot totally replace the need for these sources, as there are times when sunlight is limited. However, over the course of a year, a correctly sized solar system can provide 80-90% of your household hot water needs, or 50% of your house heating needs. A family of 3 can save about $600 per year on just hot water needs. Over 10 Years, with an average fossil fuel price increase of 10%--( it has gone up 100% in the last 7 years), you would have a payback in about 5 years, and basically savings for the next 30 years. Payback for commercial buildings in 2-3 years. The price of your house will go up more than the initial investment, many times. The average out of pocket cost for a complete DHW solar system, for a family of 3 is--- $ 3,500- $ 4,800 depending on your needs. Payback in 5-8 years on the average. How long will it take to recoup my investment? Our Solar Thermal Panels are much more affordable than most other Solar Water Heaters available on the market today. For a household of 4, it may not be much more than the cost of a new gas or electric heating system. Depending on your location, solar insolation, weather and current hot water use, the annual gas, oil, or electric savings will vary. However, in a normal household that spends 30% of its annual electric bill on water heating, the full cost of the purchase may be recouped as quickly as 4-5 years. We can design your entire system for your use if desired, and that includes a $300 credit towards the purchase of any of our Evacuated Tube Panels. There is little doubt that you will save tens of thousands of dollars, or more, over the lifetime of our Solar Water Heater, Solar House Heating systems. After the 6th year, the original $600 you were saving is now over $ 1,000 per year saved on your DHW heating bills. You will have doubled your original investment in year 9. In 16 years you will have saved over $ 17,000. What happens if one of my Evacuated Tubes is broken? A non-event. This is a simple fix. The tubes will not break for weather issues, but a baseball, rock, or falling meteor will win the battle. A broken tube will not affect the working panel other than reduce the complete Btu panel output by 243 Btu’s. When ready, you simply slide the old tube out and slide in the new one. About a $ 25 cost. The panels’s working heat transfer fluid continues to operate normally with these “Heat Pipe” Panels. With our SRCC and international Keymark certification and ratings, our solar evacuated tubes were tested over a 30 day period with extreme heating of over 450 F, shock tested, stress tested, pressure tested, and impact tested. Various size ball bearings were dropped from 32 feet and did not break the glass tubes...laying flat. Will the Solar Thermal Collector be a fire hazard during hot/dry weather? Not at all. The hot solar thermal fluid is contained within the copper lines. Each component of our Solar Collectors are high-temperature rated and non-flammable, so even during periods of strong sunlight with the pumps off (stagnation) such as in a drainback system, the system will be no fire threat. The Evac Tubes are cold to the touch even while they are producing over 150 F water to your house heating and/or DHW tank. The majority of components are stainless steel, aluminum glass or glass wool. The manifold outlet will be fitted with a pressure/temperature relieve valve, which will prevent the fluid temperature from exceeding it limits. What maintenance is required for Solar Collectors? Under normal conditions and circumstances, no maintenance of the system is required for several years. The life expectancy of the panels is over 25 years but the pumps, glycol water mix, and some valves will have to be changed at the end of their life time just like your present water heating system in use. Plan on a budget of $40 per year for these issues. The first repairs needed will not be for the solar panels, just the mechanical equipment in about 10-15 years. Can Solar Water Heaters be used for large scale hot water production? Yes. Our Solar Thermal Collectors can be added in series or parallel to provide additional water heating capacity as needed. This is particularly effective for schools, apartments, resorts, hotels, offices, and other larger buildings. 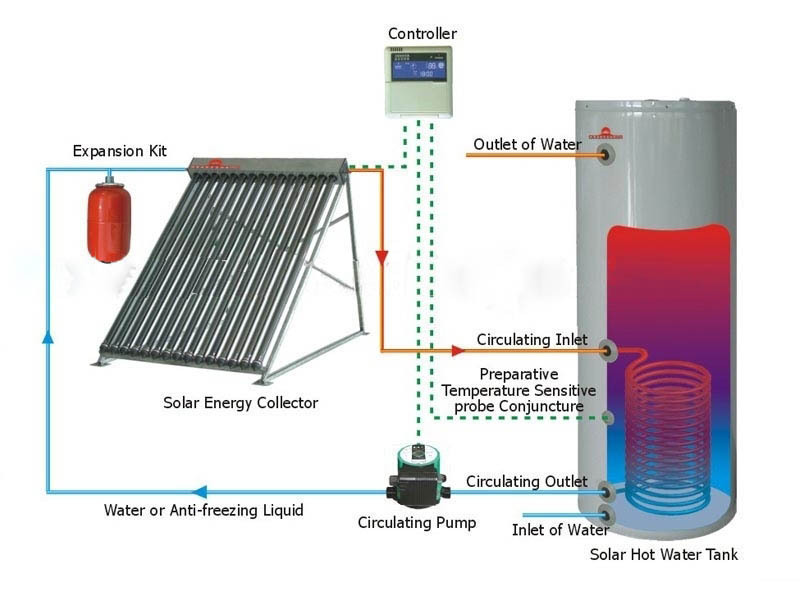 In reality, there is no limit to the amount of hot water our Solar Collectors can produce – simply increase the number of collectors as the hot water demand increases. In a nut-shell, so to speak, mid-country on the average, one 30 tube panel ($1,500 ) will produce about $250-$300 in energy savings per year and sufficient for a family of 3 for DHW. For additional house heating, you might need up to 4 panels. The savings would then then be at least $ 1,000 per year. Regardless of the size of the system, commercial or residential, the payback will always be 5-8 years, good for at least 25-35 years. Please visit our system design web site to get started.